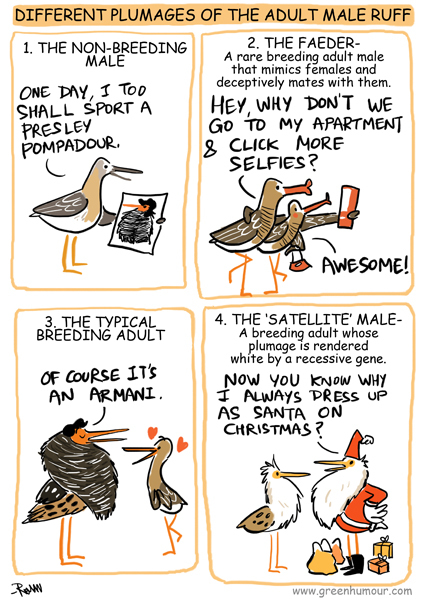 It's Wader Month on Green Humour, and the Ruff is one special wader! Renowned for displaying marked sexual dimorphism, the male ruff engages in a variety of techniques of bagging a mate in a lek. While the non-breeding plumage of a male ruff is like that of a reeve's (a female ruff), three different breeding plumages exist among breeding males- the typical breeding adult, the 'faeder' and the 'satellite' male. The comic appears in my column with The Hindu BLink today. Merry Christmas and happy birding! Prints available on my webstore. Yep! It's the Armani costume that is the most successful!